The Ford Bronco in this video is a remote control, 1/9th-scale model. It was hand built, out of wood, by Headquake RC Creations, which seems to be a guy working happily in his workshop in rural Ontario, Canada. The level of detail is amazing—the miniature driver has foam arms and looks like he’s steering—and it’s fun to watch them roam their magically out-of-scale worlds. There are more videos after the jump. Check out this Land Rover 110. 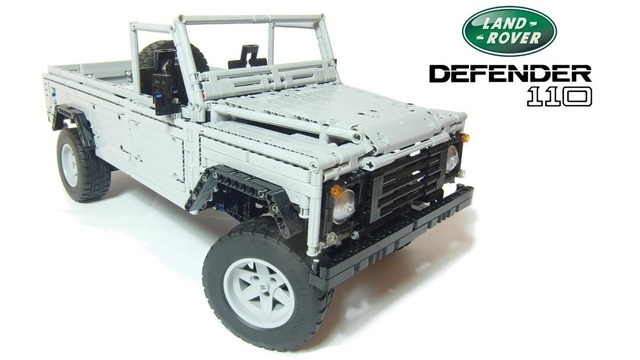 It has a sequential 5-speed transmission, 2-speed transfer case, working disc brakes, selectable 4-wheel-drive, and is made entirely out of Legos. Amazing! What’s more, every one of those features and more are actuated by remote control. Quite a project. It’s currently listed on a site called Cuusoo, which is a kind of farm league for Lego models. If it gets 10,000 votes, Lego will produce it as a kit. Read the rest for more photos and a video of it in action. Here’s a link to the builder’s site. Beautifully shot RC trucks winding their way across the forest floor to a Chemical Brothers soundtrack is more the stuff of lazy Sundays than Monday mornings. Sorry it’s a day late but maybe you can watch it over lunch.